You still have some goals and things you would like to get done before the end of the year. You have been brewing about them for sometime, but still not much progress has happened. 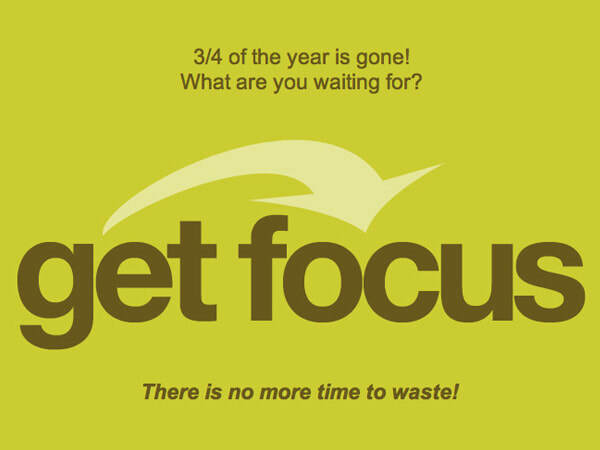 It is time to GET FOCUS! tangible goals on the final months of this year. you will not be alone on this. We will do it together. No more "thinking about it." It is time for action and I will be your partner on this. Let’s start to make this happen beginning NOW! Let's start your individually customized program today! Embrace what is possible! Break through the hurdles! Set your eyes on the goal! And start making a change today!